Queen of the South were dumped out of the Scottish Cup after a Fourth Round Replay with St Mirren ended in a 3-0 defeat in Paisley. 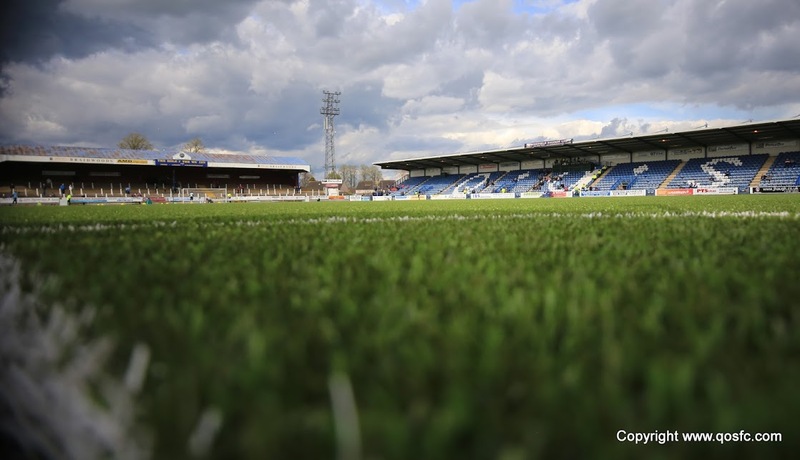 The original tie had ended in a 2-2 draw with Queens putting in one of their best performances of the season but the Doonhamers could not replicate that as despite putting the Premiership side under severe pressure in the second half they could not find a way past the Buddies` backline. Queens did start the match brightly though as Dan Carmichael found some space on the right wing but over-hit his cross with Russell lurking at the back post. This half chance in the 2nd minute was the only real piece of action in the first 15 minutes before St Mirren took control of the game. Kenny McLean stung the palms of Zander Clark with a fierce effort from range before Gary Harkins struck the opening goal on 18 minutes. John McGinn sent in a cross from the left finding Steven Thompson free at the back post who nodded across for Gary Harkins to bundle the ball into the goal. It was poor defending from Queens as they allowed St Mirren`s two dangermen far too much space inside the area. With the lead and a confidence boost the home side began to dominate the game as Harkins tried an audacious long range lob from 40 yards but with Zander Clark scurrying backwards the ball flew a yard over the crossbar. Clark made a save from a Kenny McLean effort before Harkins created another chance for himself as he drove at the Queens defence before opening up his body to curl the ball into the far corner but sent the ball well wide. Queens were yet to make any headway in the contest and rarely threatened the home goal and again had their goalkeeper to thank as he pushed a looping John McGinn header wide of his far post after 39 minutes. It was not until the 41st minute before the away side managed a shot at goal and almost made it count as Derek Lyle followed up Dan Carmichael`s dangerous cross with a half-volley that skimmed off the top of the crossbar. After a poor first half display Queens had it all to do to get back into the cup tie and obviously the manager`s words during the break had made some effect as the Doonhamers pushed the home side back for large parts of the half. The first chance came straight from the kick off as Stephen McKenna burst past Jim Goodwin to find Carmichael in the right-hand channel. The winger got his head up to find Iain Russell inside the area but he could only fire the ball over the crossbar. Then on 56 minutes Queens struck the goal-frame again through Iain Russell as the striker ran at the St Mirren defence before cracking a long range effort toward goal. The ball clipped a defender and looped over the stranded Marian Kello but onto the crossbar. McKenna then sent a header wide from Mark Durnan`s set up following a corner before Lyle stretched on 62 minutes but could not get enough on Ian McShane`s free-kick delivery at the far post as Queens continued to threaten an equaliser. The home side had struggled to produce any sort of attacking move in the second period but began to work their way back into the game as they forced the Queens defence to defend a number of corners. Conor Newton had an effort from an angle saved by Clark before the Premiership side extended their lead after 72 minutes through Steven Thompson. The home side could thank lady luck as Marc McAusland`s attempted shot was mis-hit before deflecting off Kevin Holt and into the path of Thompson who beat Clark from close range. It was a tough one to take for Queens as their play in the second period had deserved more. St Mirren almost snatched another counter-attack goal as Thompson played in John McGinn but Zander Clark raced out to meet the midfielder and did well to block, forcing the ball wide of the goal. Derek Lyle then had a gilt-edged chance to halve the deficit as Dan Carmichael`s cut back found the Queens striker with time to pick his spot from 18 yards but saw his effort blocked by Darren McGregor. Queens started to chase the game going into the last ten minutes as Mark Durnan was thrown forward as a makeshift striker but the gamble backfired immediately as they were caught short at the back giving substitute Sean Kelly the chance to fire past Clark from the edge of the area with just four minutes remaining. The goal capped a miserable night for Queens that could so easily have gone the other way as a series of missed chances added to some misfortune at the back gave the Premiership side a comfortable-looking three-nil scoreline. 20:18 Good evening folks and welcome to Paisley as Queens aim to topple Premiership St Mirren in this Scottish Cup 4th Round Replay. 20:20 The first game finished in an entertaining 2-2 draw at Palmerston. Queens will be looking to repeat that performance tonight. 20:25 And tonight`s whistler is Crawford Allan assisted by flagwavers Stuart Hodge and Sean Carr with George Salmond as 4th official. 20:43 Queens have competed well against higher division opposition this season, beating St Mirren and losing out to Hearts on pens. 3 min Decent start for Queens as Carmichael gets in down the right but couldn`t find Russell before Burns was beaten by the `keeper to a cross. 6 min Queens have lined-up in a 4-2-3-1 formation with Russell up top, Lyle on the left, Burns right and Carmichael in the hole. 13 min Both teams are feeling their way into the game with the wind causing the players some problems. No efforts on goal as yet. 18 min Great save Clark! McGinn played the ball to Kenny McLean who let fly from 30 yards forcing Zander Clark to push the ball wide of the post. 19 min Poor from Queens as Thompson is left free at the back post to head back to Gary Harkins who nets at the second attempt. 20 min St Mirren`s confidence is up and Gary Harkins tries a cheeky chip from 40 yards which flies a couple of yards over. 22 min Queens really need to settle themselves as Clark makes another save this time from McLean. St Mirren putting the pressure on. 26 min A bit better from Queens as Holt forces a corner which is cleared before Higgins sclaffs a cross over the bar. 28 min Queens have swapped Lyle and Russell around with Russell coming onto the left wing to try and get themselves back into this tie. 31 min Decent chance for St Mirren as Gary Harkins drives down the left and tries to curl it into the far corner but puts it well wide. 35 min Dangerous moment for Queens again as Grainger`s low cross from the left beats Clark but rolls across the six yard box with nobody there. 39 min Good save Clark. St Mirren threaten again as McGinn sends a looping header toward the far post but Clark pushed it wide. 41 min Off the bar Lyle! Queens put together their best move of the match as Lyle follows up a Carmichael cross and cracks a volley off the bar. 45+1 min ... Mitchell`s cross is very poor though and hits the first man before Russell miscues a volley high, wide and net very handsome. Half Time Not a vintage half from Queens by any stretch as they have really struggled to get themselves into the game. Half Time It is only 1-0 though and if Jim McIntyre can work some magic in the dressing room then who knows? Much improvement needed. 46 min Straight from kickoff Queens are in as McKenna bursts past Goodwin to play in Carmichael on the left before Russell sent the cutback over. 47 min Yellow Card : St Mirren`s McGinn is late on Queens `keeper Clark and is booked. 51 min There has definitely been a reaction from the Queens players after half-time with the Doonhamers forcing the play since the break. 52 min Almost a half chance for Queens as McShane`s free-kick from deep finds Durnan at the back post but Goodwin clears the danger. 53 min Yellow Card : Derek Lyle and Jim Goodwin both find themselves in the book after some pushing and shoving in the area. 56 min Off the bar Russell! Almost a bit of luck for Queens as Russell`s long shot clipped a defender and looped onto the crossbar. 57 min From the corner another half chance as Durnan heads the ball across and McKenna sends a header a yard wide. Much better from Queens this. 60 min ... Mitchell`s corner is headed clear before Higgins tries a shot from 25 yards but fires well wide. 62 min Queens are getting closer as Lyle can`t quite stretch enough to put McShane`s deep free-kick in at the back post. 65 min Chance for St Mirren as Gary Harkins has time to play in Conor Newton who strikes straight at Clark from an angle. 71 min St Mirren have crept beck into the game and have forced a number of corners. They`ve been well dealt with though by the Queens defence. 74 min St Mirren hit Queens on the break and get a whole chunk of luck as McAusland`s mis-hit shot drops right at Thompson`s feet 8 yards out. 76 min Good save Clark as Queens are caught again as Thompson plays in McGinn but the Queens `keeper is out quickly to block. 77 min St Mirren make the first change of the game as Kelly replaces McGinn. 79 min Great chance Lyle! Queens should have one back as the ball drops behind everyone to Lyle with space 18 yards out but his shot is blocked. 85 min St Mirren replace scorer Stevie Thompson with Thomas Reilly. 87 min Queens have thrown Durnan up front and are caught out straight away as Kelly finds space to fire into the top corner. Game over. 22:34 Disappointing result for Queens as they just couldn`t force an equaliser early in the first half and were caught on the break.